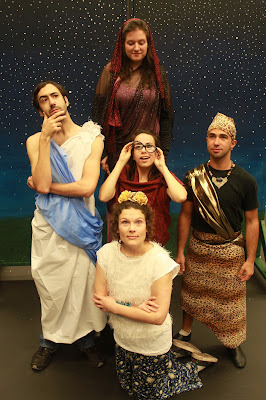 Patel Conservatory: From the Blog: Quest for the Stars, a musical for kids! This weekend, kids can learn about astronomy in the musical production of Quest for the Stars! Produced by our Patel Conservatory Theater department, it’s a show created especially for kids with the idea that theater can be both entertaining and educational. Directed by Jack Holloway, artistic director of Tampa’s Hat Trick Theater, the show is a time-travel adventure that explores science and history. Holloway performed in children’s shows for six years with the Eckerd Theater Company. He also currently teaches Creative Drama at the Patel Conservatory, as well as Conservatory outreach classes for St. Peter Clavier. “What I love about children’s theater is that you’ll never find a more honest audience. If they’re bored, or if you talk down to them, they’ll let you know,” he said. Quest for the Stars was created by students in the Patel Conservatory’s Theater for Young Audiences program last year, along with nationally recognized playwright Doug Cooney. The show begins in the year 2061 as elementary school student Eve feels defeated by a book report assignment. She travels back and forth through time to receive help and inspiration from historical figures such as Ptolemy and Cleopatra. Eve learns the importance of asking questions and having a sense of curiosity. Some Patel Conservatory theater students will attend the show as part of their course curriculum. Parents and siblings who purchase tickets are welcome to sit with their students. Tickets are just $7 through Sat., Sept. 7, and $10 at the door. For tickets, call 813-229-7827, click here, or visit our box office in person.